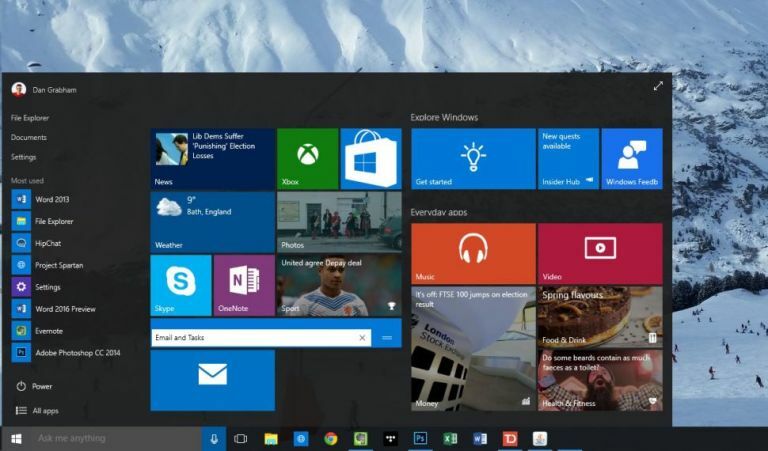 The Windows 10 release date is 29 July. and it's such a significant upgrade that Microsoft skipped Windows 9 altogether. The OS is designed to run seamlessly across desktops, laptops, tablets, smartphones and the Xbox One. Is it going to be enough to keep Apple's share of the computer market from growing even further? Here are the features built into Windows 10 that could convince shoppers to pick up a Windows 10 laptop rather than a MacBook the next time they're in the market for a new machine. Tapping a password into your computer seems anachronistic these days, and Microsoft obviously agrees — Windows 10 will debut Microsoft Hello, a new set of security protocols that enable you to log into your laptop or desktop with face recognition (thanks to your webcam). There will also be support for fingerprint and even iris recognition, should your computer offer those features, giving you a variety of ways to confirm your identity. Windows 10 should be much easier to operate on a non-touchscreen device than Windows 8 is (see the next entry below) but that doesn't mean Microsoft is abandoning touch altogether. The new OS will be simple and straightforward to use on touchscreen devices, and that could make a big difference for laptops that double as tablets and large all-in-ones. Not everyone needs good touchscreen support but plenty of people do. When Microsoft excised the iconic Start menu from Windows 8 there was an outcry among users, and the Redmond firm has wisely seen the error of its ways. The Start menu is back, combining the best of its Windows 7 incarnation with added support for live tiles and full-screen apps (which will work much better with the desktop). Windows 10 keeps the best features of Windows 8 while bringing back the options people missed from Windows 7. Both Google and Apple have separate operating systems for the desktop and mobile, but Microsoft is going the other way. Windows 10 will run on devices of all sizes and the universal apps designed specifically for it will do the same — you'll be able to jump from laptop to phone to tablet very easily, taking all your content and settings with you. That could make a big difference if you're often on the go and want a seamless experience. Siri, schmiri — while Apple works out what it wants to do with its voice assistant on the desktop, Microsoft is busy rolling out Cortana to all of your devices (there are even iOS and Android versions on the way). Cortana can search the web smartly for you, remind you to pick up the milk, manage your schedule, tell you about traffic delays and more besides: it's becoming one of Microsoft's most promising products and it's built right into Windows 10. Once the dominant player in the browser market, Internet Explorer is now really showing its age. Microsoft Edge is its modern replacement, ready to be ushered in with the arrival of Windows 10, and it promises a simpler and faster web surfing experience. It lets you annotate web pages, supports extensions and has an interesting New Tab page that helps you get started more quickly. Watch out Chrome, Firefox, Opera and Safari. The full-screen modern apps running in Windows 8 (for mail and contacts and so on) always felt half-baked and rushed, but they'll be much more sophisticated and useful by the time Windows 10 rolls around. As we've already mentioned, they'll work better on the desktop thanks to the new windowed mode. What's more, the new breed of apps are much better at catering for both touchscreen input and mouse and keyboard control. One device Microsoft does have that Apple doesn't (yet?) is a top-of-the-line games console. If you're a keen Xbox gamer then you have more reasons than ever before to get yourself a Windows 10 computer: the primary one is the ability to stream gameplay from your console right to your desktop. The Xbox app for computers is getting a revamp too, and a version of Windows 10 will form the basis of the Xbox One's next major software update.